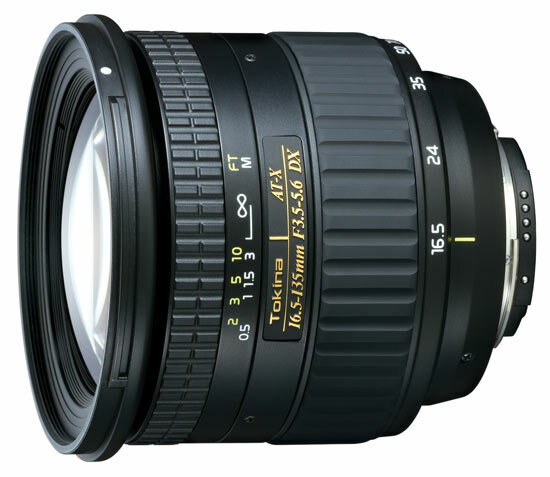 The lens has a focal length of 16-135 mm. Since the lens is designed to be used on a camera with smaller sensor ('APS-C') the focal length will be equivalent to 26-216 mm if you have a Canon camera or 24-202 mm if you have a Niko camera. The lens brightness and aperture value is f/3,5-5,6. One thing to consider is that the lens has a variable brightness, which means that depending on how much you are zooming the lens will have a different maximum aperture value. At 16 mm the lens brightness is f/3,5 and at 135 mm the brightness is f/5,6. Through the link below you can read more about what this could mean for you as a photographer. Text from Tokina: "This Tokina compact super wide zoom range begins at 16.5mm and offers the photographer a wider angle of view than most lenses in its class that start at 18mm. This makes the lens better suited for scenic and travel photography in addition to being a great standard lens for most general photography situations. The AT-X 16.5-135 DX’s optical design benefits from the latest advances in the industry. Three aspherical elements, one all glass precision-molded element and 2 compound elements yield high contrast. Additionally two Super-low Dispersion (SD) glass elements correct chromatic aberration. The AT-X 16.5-135 DX has a newly designed high-precision mechanical zoom cam system minimizes play and eliminates zoom creep "